My next build up event for Spartathlon was “Leila’s Run” a small, low key memorial marathon event (which was a lovely thing to do to remember someone by) and this took place on the 16/8. The event is an undulating lapped event with a mix of road and some trail and competitors had the option of completing 1 (10k), 2 (Half Marathon), 3 or 4 (Marathon) laps of the course. The plan for the event was another comfortably quick run and I made the hour (ish) drive from home to the event in the morning before registering and then generally hanging around waiting for the race to start. The weather was a little overcast at the start but this started to clear as the race start approached and the day ended up sunny and warm but not that hot. I was probably one of the few people who would have preferred hotter weather but this is British Summertime so you can’t have everything. As the race got underway, a half a dozen runners went out ahead of me and I settled into a comfortable pace. 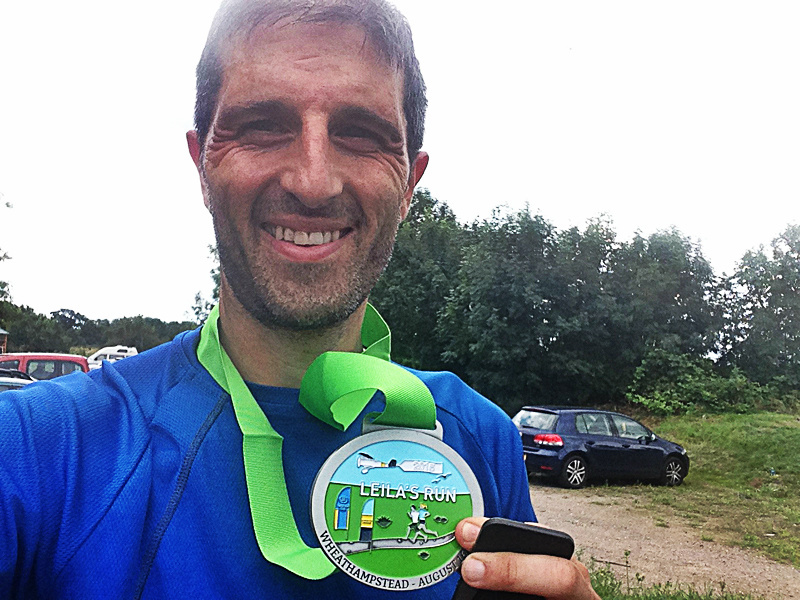 The course is essentially a loop around Heartwood Forest, Wheathampstead and I started off through some roads before moving onto country lanes with the occasional trail section. The course has a number of ups and downs but nothing too hilly although my legs did feel the ups on the last lap. The trail was well marked with signs, arrows and floor markings which were very straight forward to follow. I ran by myself for a little while before catching up with a chap ahead of me (I forgot to ask his name so apologies in the unlikely event he reads this) and we chatted for the next couple of laps about running which helped pass the time. It was definitely warming up weather wise and I was taking the opportunity each lap to take on board some energy drink, S-Cap and a gel or snack to keep the energy up. On lap 3, I drifted ahead of my fellow runner and then started to lap a few people on the course. It was nice to see odd people ahead but I pretty much ran by myself. A couple of the guys who were ahead of me stopped after a few laps and I then found myself creeping towards the front of the field. Thanks to Anna Hatton for the picture. I quite enjoy lapped or looped events and mentally it’s good to tick off the laps and familiar signs and places. The 3rd lap is always the tricky one and the last lap is the nice one. My pacing was pretty constant around the 7-7.30m/m range with the terrain largely governing the pace per mile (slightly quicker on the downs and slightly slower on the ups). It was good to get onto the last lap and it was just a question of head down and keep moving along. The last lap definitely felt a little more of an effort as I was starting to feel the ups and downs in my quads and calves. I passed the mid-loop checkpoint and someone mentioned I was in 2nd place and about 5 mins behind the leader. With 3 (ish) miles to go that’s a fair amount of time to make up and I had no idea how fast he was running so it was debatable whether I could have caught up or not. Therefore I continued at a broadly similar pace judging this was too far ahead and not wanting to push as this was a planned training run as I kept telling myself (that was my excuse!). I passed a few more people (the event was well supported by the 100 Marathon Club runners who were out in force today and there was someone celebrating his 100th Marathon that day) and kept up my steady pace before recognising the familiar signs and turns by now near the finish. My finishing time (according to the Garmin) was 3.16.52 over a recorded 27 mile distance. With a warm day, a mix of road and trail conditions and several ups and downs I judged this to be a good effort and was pleased with how the run went. I had ended up in second place with the winner a few minutes ahead but for small, low key events positions can vary depending on who turns up and runs on the day so I tend to judge these efforts on my own finishing time and the course conditions. Overall, a good workout and another milestone achieved in the overall training plan. I’m planning 3 more weeks of heavy mileage before starting a taper but I have neglected the quality sessions so will need to try and get some hill rep sessions completed over the next few weeks. 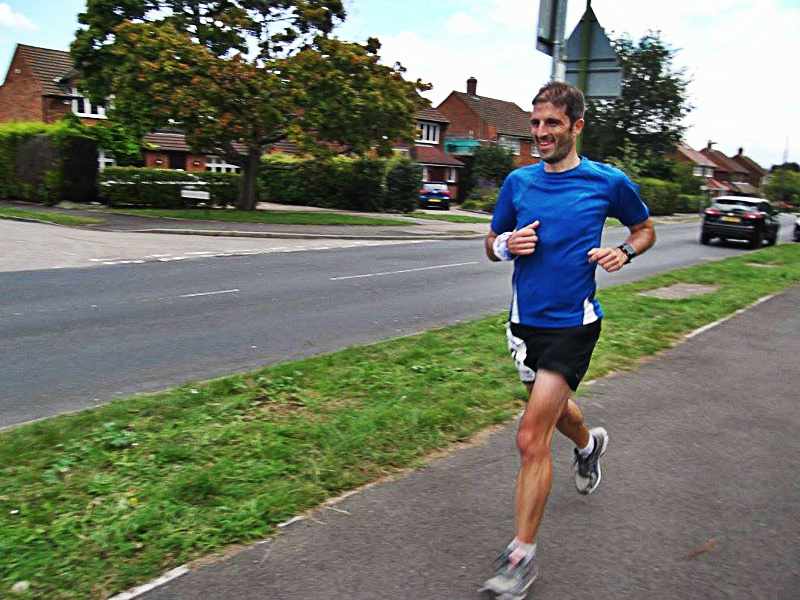 I have the Farnham Pilgrim marathon planned a couple of weeks before Spartathlon but this is intended to be “the” last long run and a very.. very.. steady pace is planned due to the proximity of this event. Thanks to the team who put on the Leila’s Run event, it was a friendly, well organised event and I enjoyed the route.